Sometimes the most surprising things come from the most unexpected places. Who could have predicted that one of the greatest rock bands of all time would come from Liverpool, England? Here's another one for you. The composer responsible for the exciting orchestral music on this new release isn't from Los Angeles or New York--he hails from a smaller city in Ohio. 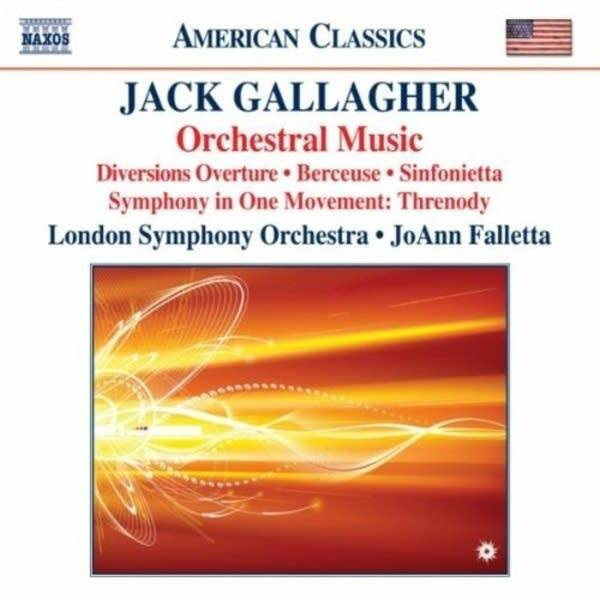 American conductor JoAnn Falletta unearthed four orchestral works by Jack Gallagher and recently recorded them with the London Symphony Orchestra. JoAnn Falletta serves as music director for two American orchestras, the Buffalo Philharmonic and the Virginia Symphony. She also guest conducts various ensembles as she does on this new release. Her success is due in part to her crisp approach of performing, and recording works and composers that deserve more attention, like Jack Gallagher. Jack Gallagher is a Music Professor at the College of Wooster in Ohio. He earned his composition degrees from Cornell University. Gallagher has taken part in seminars with composers like Ned Rorem, and he's sat in on master classes with other American greats like Aaron Copland, George Crumb and William Bolcom. This new release opens with Gallagher's "Diversions Overture," composed in 1986 for the Wooster Symphony Orchestra, based at the small liberal arts college where Gallagher teaches. The reflective beginning of this piece is somewhat reminiscent of Copland's "Quiet City," with its slow, spacious tempo and its use of woodwinds and trumpets to symbolize roaming thoughts. The contrasting middle section features a thrilling brass chorale, which pauses for a few expressive harp glissandos. Gallagher dedicated this musical adventure to his son and daughter. The piece I keep returning to is the "Berceuse." This heartfelt piece blossomed from a lullaby Gallagher wrote for the daughter of friends. It's a lyrical work for small orchestra. A gentle rocking 6/8 pattern sets the stage. The lush string section swells into a powerful crescendo, accented by pairs of flutes, clarinets, horns, trumpets and timpani. This piece seems to be filled with memories. You might find yourself drifting back to explore a few of your own memories as you listen. This new release features the world premiere recording of Gallagher's Sinfonietta for String Orchestra. This work started as "Two Pieces for String Orchestra," and was expanded a year later into five movements. Multiple pizzicato stops with rapid passages based on alternating whole tones and semitones accentuate the opening "Intrada." The "Malambo," named for a lively Argentinean dance in compound meter divided into three parts is my personal favorite. It races along smoothly, and somewhat unpredictably, really grabbing my attention. The "Symphony in One Movement: Threnody," closes out this new release. It was commissioned by the Women's Committee for the 75th Anniversary of the Wooster Symphony Orchestra in 1991. Jack Gallagher revised this work in 2008, dedicating it to his father, and to the loving memory of his mother who died unexpectedly as he was writing this piece. This Symphony begins quietly in divided violins conveying a sense of longing. That mood is disturbed several times as the tempo spirals into the faster, more animated second section. Just as it may have seemed unexpected for a great dance sensation like Fred Astaire to call Omaha, Nebraska, home, it may be equally surprising to discover this new recording of orchestral music was also born in the Midwest. After listening to this new collection of orchestral works by American composer Jack Gallagher, you'll be grateful for the on-going mission of conductor JoAnn Falletta whose musical quest is to spotlight well-deserving composers and their music.